New Page Transitions There are 7 new page transitions (total of 29) that work great with both Websites and Presentations. 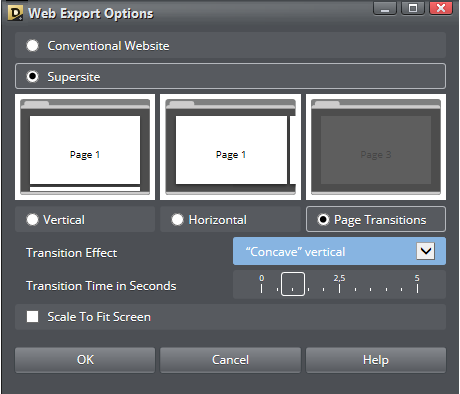 You can use the same transition for the entire site, or use a different transition for each page. I counsel restraint, but I tend towards the conservative. Just because there are a whole bunch of page transitions does not mean you have to use each and every one. But they are cool and it is a temptation. Supersites A brilliant new option in Designer Pro X10 is called Supersites. Supersites scroll horizontally or vertically. There are three kinds of Supersites as you can see to the right, Vertical, which scrolls up and down, Horizontal, which scrolls side to side, and Page Transitions, which don’t scroll but use any of the 29 Page Transition effects. Scale to Fit Screen is an option that scales the page to fit any device whether desktop browser, tablet, or smart phone. The Scale to Fit Page option only works with Supersites and Supersite Presentations and scales the entire page proportionately to fit the device. NOTE: Scale to Fit Screen works best if the page is square or close to square. Supersites work great with tablets and mobile devices and can be navigated by swiping the page. 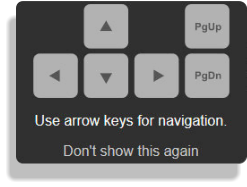 These sites can also be navigated with a scroll mouse. The page transitions are hardware accelerated, supported by most current browsers and mobile devices. Free Web Hosting Package! Owners of Designer Pro X10 get one FREE year of M website hosting with Magix Online World. This includes 2 GB of server space, a free domain name, and a free web-based email package that includes up to 5 mailboxes. Owners also get Password Protection for their web pages (via Magix). (Designer Pro X9 owners get coupons that let you extend your free Magix Online World M web hosting package for another year when you upgrade). Presentations Update Website Presentations (I like to call these XaraPoint Presentations), are a great way to share information with colleagues and prospective customers. You can create self-guided presentations, or ones that you manage remotely for invited guests only. This is not new but just worth reminding you about. Two new empty page templates let you design in HD ratio 16:10 and in the more traditional 4:3. When you display a Supersite Presentation, a pop up appears to remind your visitor that she or he can use the Page Up and Page Down keys as well as the arrow keys to navigate through the pages of your presentation.